These rain boots bloom with van Gogh's famous irises. 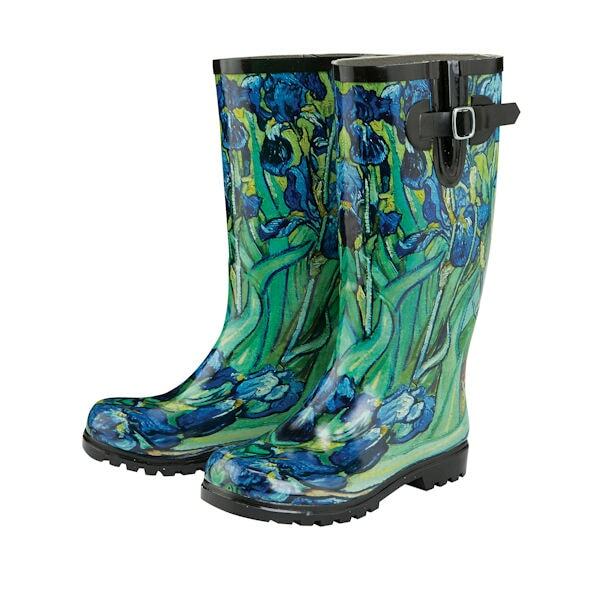 Traditional Wellies-style boots have rounded toes, side gussets with buckle straps, and deep-grip nonskid treads. Rubber uppers, soft fabric linings, black trim. 13" shaft, ½" heel. Whole sizes 5-11. (Half sizes, order up.) Imported. Item can only be shipped within the Continental US. Please note: Delivery time for this item is 1-2 weeks.